The FCC Wednesday passed a Report and Order the agency says takes a major step toward holding a 5G spectrum auction in 2019. The new rules will promote the availability of high-band millimeter wave spectrum. The airwaves in the combined upper 37 GHz and 39 GHz bands are the largest amount of contiguous spectrum available for wireless service in the millimeter wave bands—2,400 megahertz in total—while the 47 GHz band provides an additional 1,000 megahertz of spectrum, according to the Commission. In response, Wireless Infrastructure Association President Jonathan Adelstein said: “The action will help the U.S. continue to lead the world in wireless innovation. 2018 has been a banner year for the Commission in laying the foundation for next generation wireless services.” The open meeting, he said, continues the FCC’s commitment to win the race to 5G. The NAB has been predicting a shortage of tall tower crews, plus winter weather, will seriously impact some broadcasters’ ability to meet the FCC’s spectrum repack deadlines. Now, those predictions are coming true. While Phase 1, which ended two weeks ago, was successful, with 79 full-power television stations meeting the deadline, 11 needed an FCC waiver. The new Disaster Response and Recovery Working Group of the FCC’s Broadband Deployment Advisory Committee has begun its work. The agency asked the new group to develop best practices for coordination among wireless providers, backhaul providers, and power companies before, during and after a disaster. Red Grasso and WIA President/CEO Jonathan Adelstein co-chair the working group. Huawei has faced increased scrutiny in the U.S. and other countries, as lawmakers and security experts warned of potential national security risks from using Huawei products. The U.S. is concerned the Chinese government could be using Huawei’s networking technology to spy on Americans, which the company denies. According to AT&T, upgrading its network over the next few years in order to expand mobile capacity will involve the installation of over 60,000 “white box” routers on their towers. Andre Fuetsch, President, AT&T Labs and Chief Technology Officer, outlined plans during the Open Networking Foundation’s Connect Conference in California. “Traditionally, we bought these routers from a handful of vendors, and the equipment was highly specialized and came with specialized software,” said Fuetsch. So, rather than buying a single, closed package, the carrier is designing their own hardware specs for routers and encouraging any manufacturer to build to those specifications. This is known as the “white box” model. UPDATE Microsoft is increasing pledges for its Airband Initiative, the program that uses several technologies, including TV White Spaces (TVWS), to bring high-speed connectivity to rural areas. Company President Brad Smith said at a lunch event in Washington, D.C., yesterday, the company is raising its goal to bring broadband access to 3 million — up from 2 million — by July, 2022. TV White Spaces are unlicensed spectrum between television channels. The initiative launched 17 months ago. The company will also expand the program to an additional nine states next year. It’s currently deployed in 16 states with commercial partnerships. The new states include California, Indiana, Mississippi, Oklahoma and West Virginia. The City of San Jose, along with fellow cities and municipalities in western states, filed a petition last week to move their court case against carriers over the FCC’s September ruling to deregulate small cell deployment. The San Jose Petitioners, one of six groups seeking review of the FCC order entitled “Accelerating Wireless Broadband Deployment by Removing Barriers to Infrastructure Investment,” want the case transferred from Denver to San Francisco. San Jose, et al, are challenging the agency’s decision to limit how much munis can charge to attach small cells to streetlight poles and other infrastructure in public right-of-ways. The decision also sets limits on how long munis can take to make a decision on a small cell application. The FCC ruling is due to take effect in January. Carriers tell the FCC, the Wireless Resiliency Cooperative Framework facilitated industry efforts to maintain networks and restore service after recent hurricanes. FCC Chairman Ajit Pai said he would look into how the agreement is working after initially being disappointed with the pace of network restoration efforts in Florida following Hurricane Michael. The framework is an industry-led, voluntary initiative, in which carriers cooperate to restore networks during and after emergencies. Responses to the inquiry from the Public Safety & Homeland Security Bureau were due to docket 11-60 Monday. Though portions were redacted, Inside Towers was able to glean the main points of the carriers’ responses. UPDATE Broadcasters urged the FCC this week to be flexible in how the agency reimburses FMs, low-power TV stations and TV translators for repacking expenses. Reply comments were recently due to docket 18-214 on the agency’s proposed catalog of reimbursable expenses, including tower mapping, rigging and new tower construction. Broadcasters in phase one of the repack must be moved to their new channel by this Friday. 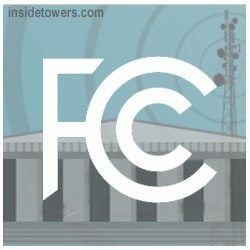 NPR suggested the FCC maximize relief and minimize obstacles for “innocent bystander” FMs so they can avoid or reduce the duration of service disruptions to listeners. NPR seeks flexibility to provide reimbursement for costs not listed in the catalog and expenses that are higher than the suggested ranges. UPDATE The collapse of the 1,890-foot KOZK tower in Missouri and resulting death of contractor Steve Lemay was recently ruled on by OSHA, as to the cause of the accident. The report was obtained and published by Current, per its request of the documents, through the Freedom of Information Act. In April of 2018, Missouri State University (MSU) contracted Tower Consultants, Inc. (TCI) to design the required structural modifications necessary to support the transmission line replacement. MSU owned the KOZK tower, an 1,890-foot guyed tower along Highway FF north of Fordland, MO. TCI’s scope of work involved creating construction documents, reviewing submittal drawings, observing the construction process including producing progress reports and assisting MSU in the bidding and contractor selection process. MSU selected Steve Lemay, LLC to serve as the contractor. Trying to avoid needless fiber cuts after a major storm is a goal for the FCC. Chairman Ajit Pai recently formed a new working group for the agency’s Broadband Deployment Advisory Committee to develop recommendations for network restoration and resiliency. Commissioner Brendan Carr said after last Thursday’s FCC meeting, some 7,000 restoration personnel were in Florida when he was there after Hurricane Michael. A lot of the network fiber survived the hurricane and subsequent storm surge, but telecoms complained of needless fiber cuts hampering restoration efforts, Inside Towers reported. O’Rielly said the situation improved after phone calls and face-to-face meetings between utility and telecom executives. U.S. device manufacturers will soon be able to establish a connection between smartphones and the EU’s satellite constellation known as Galileo. The result, say FCC officials, means consumers will be able to benefit from improved availability, reliability, and resiliency of navigation and timing services on their smartphones. The FCC approved a waiver of its rules so non-federal users can access specific signals transmitted from Galileo. Inside Towers’ database shows over 150 registered tower sites within a 30-mile radius of Chico, CA, the epicenter of the Camp Fire. A full list of sites within that zone can be found on the Inside Towers database. AT&T is installing 80 new small cell 5G poles on the streets of Baton Rouge, and it “has created a lot of chaos downtown,” according to City-Parish Chief Administrative Officer Darryl Gissel. In mid-October, an AT&T subcontractor struck an underground power line during one installation creating a massive power outage in the city. Adding to the deployment woes, local residents expressed shock and opposition to the 29-foot black metal poles upon unexpectedly seeing their installation. Executive director Davis Rhorer said several property owners have contacted the Downtown Development District to dispute the locations of the towers, and how close they will be to their businesses and homes. Metro Council passed an ordinance establishing the regulations for small cell installation in 2017, allowing the poles to be built in the public right-of-way, according to Business Report. is up and running at Canyon View Drive in Paradise, CA Tweet: Leland Kim. Even though yesterday was a federal holiday, some personnel at the FCC’s Public Safety and Homeland Security Bureau were in contact with carriers and safety agencies in California as the wildfires continued to burn. FCC Commissioner Brendan Carr tweeted that agency staff are “engaged and closely coordinating” efforts to maintain and restore communications in the affected areas. Paratroopers from the Army’s 1st Battalion, 508th Parachute Infantry Regiment, nicknamed the Red Devils, are on the front lines of military technology, testing phone connectivity under battle conditions at Fort Bliss in Texas. The Fort Bliss Bugle explains the unique field concerns that soldiers face. While civilians rely on a network of cell towers to connect their calls, the Army has to carry its own network with it. The digital network that was in force, Nett Warrior, had too many limitations and was unwieldy to use. “Nobody was using the Nett Warrior devices,” said Maj. Andrew Miller. The 44 groups that make up the Connect Americans Now Coalition, including the Rural Wireless Association, Microsoft, the App Association and the National Rural Education Association, want the FCC to allow TV white spaces to be used for rural broadband deployment. The network operators, equipment providers and rural broadband advocates are using a combination of wired and wireless technologies to do this now, including fiber, as well as terrestrial and satellite fixed and mobile wireless, using several frequencies. IBM is suing Corning in federal court in Georgia for a “botched” design of a cellular distributed antenna system installed at the Atlanta Falcons’ Mercedes-Benz Stadium, reports Mobile Sports Report. IBM contends Corning failed to deliver a working DAS, according to the court filing, and that the Falcons and the NFL needed to spend additional “millions” to make the system operational. The issue is of interest, as the stadium will host the Super Bowl in February 2019. IBM does not list a specific compensation amount in the suit. Instead, it intends to seek “damages in an amount to be proven at trial.” In its filing, IBM asserted it bought about $20 million in equipment and materials from Corning to build the DAS. Could Some New Entrants Get CBRS Licenses by Year-end? Some of the new entrants on the Citizens Broadband Radio Service (CBRS) could be operating on the band by year-end. There will be plenty of opportunities for new uses, according to K.C. Halm and Van Bloys, attorneys for Davis Wright Tremaine. They described FCC changes and potential future CBRS band use cases in a Wireless Infrastructure Association webinar yesterday. The calls within and outside the FCC are getting louder, to take a fresh look at whether auto safety communications and WiFi can share the same spectrum in the 5.9 GHz band. The Commission this week released results of tests performed on prototype devices to explore potential sharing solutions between the proposed Unlicensed National Information Infrastructure (U-NII) devices and Dedicated Short Range Communications (DSRC) operations in the 5850-5925 MHz (U-NII-4) frequency band. DSRC uses short-range wireless communication links to facilitate data transfer between vehicle to vehicle, and between vehicles and roadside infrastructure. More than 20 cities and counties are challenging the FCC’s new small cell deployment order in federal court. They asked a federal appeals court to block the rule limiting what localities can charge telecoms, for installing cell sites for 5G wireless networks. Three lawsuits were filed Wednesday and Thursday by nearly two dozen cities, including Seattle, Washington; Portland, Oregon; Los Angeles; and San Jose, California, reported The Hill. The rule, not slated to go into effect until January, caps what municipalities can charge to deploy a small cell in a public right-of-way to $270 per site. It also imposes time limits governing when localities must either approve or reject siting applications. When the FCC voted on the change last month, Commissioners said the move would free up to $2 billion in capital that wireless carriers can use to deploy broadband in rural areas. The White House issued a Presidential Memorandum on spectrum policy Thursday that directs government agencies to take several actions to further deployment of 5G wireless networks. It directs the Secretary of Commerce to work with federal agencies and industry stakeholders to develop a long term, comprehensive national spectrum strategy, with the goal of maintaining American leadership in wireless networks, whether 5G or any future technology. The memo builds on an administration meeting earlier this month organized by the White House National Economic Council that brought together 150 stakeholders from government, industry, and academia, to discuss jump-starting 5G technology, Inside Towers reported. The Commerce Department’s National Telecommunications and Information Administration (NTIA) will work with members of a new Spectrum Strategy Task Force in a multiyear effort to develop and implement the national approach, according to NTIA Administrator David Redl. “The strategy will be informed by examinations of spectrum use, and will help policymakers meet our needs both now and in the future. It will also help align research, development, testing and evaluation efforts,” he said in a blog post. The Utilities Technology Council is not happy at all with Tuesday’s FCC vote for a rulemaking to open up the 6 GHz band, saying unlicensed use could interfere with critical utility operations. Unlicensed devices use the 2.4 and 5 GHz bands for products like baby monitors and cordless phones, and Commissioners say those bands are congested and they want to open up the 5.925-7.125 GHz band. Portions of the 6 GHz band are heavily used by licensed incumbents such as utilities, point-to-point microwave links, the Broadcast Auxiliary Service and Cable Television Relay Service. The FCC proposes to allow unlicensed devices to operate using an automated frequency coordination system to avoid causing harmful RF interference from unlicensed devices to licensed users, Inside Towers reported. The FCC voted Tuesday to update the Citizens Broadband Radio Service (CBRS) in the 3.5 GHz band, saying the changes would increase incentives, innovation and investment for 5G and other services. Supporters, like large carriers, say the changes will provide certainty to those who wants to introduce new services. Opponents, including some small broadband providers, say it will do the opposite, and the result will be a 5G-only band. FCC Commissioners took care to describe their compromise effort during the vote, but divisions were evident. The original rules, established in 2015, enable shared access between federal and non-federal users, consisting of incumbents, Priority Access Licenses (PALs) and General Authorized Access users. The Report and Order changes the size of PAL licenses from census tracts to counties and extends PAL license terms to 10 years. The costs of co-locating on a TV tower involved in the channel repack is getting very real for FM owners. Now is the chance for them, as well as owners of Low-Power TV and TV translators, to tell the FCC about the financial impact of the repack. The agency is seeking public input on its proposed catalog of reimbursement costs for services like tower rigging and new equipment. The agency believes the catalog will facilitate the reimbursement process, much like it is for full-power and Class A TV stations. It was developed by a third-party tower consulting firm, to identify price ranges for potential services and equipment, based on a market survey of industry vendors. The Small Wireless Facilities Deployment Act (House Bill 2564), which was proposed to help with 5G infrastructure, ran out of time and no companion bill was introduced to the Pennsylvania Senate, reported The Philadelphia Inquirer. The sponsor of the bill, State Rep. Frank Farry, told Inside Towers in an interview, he put the blame on a crusading lawyer bent on derailing the legislation as the reason for its demise. The proposed legislation would have made it easier to put thousands of small cell antennas on utility poles, buildings, traffic lights, or other public property for 5G services. The Wireless Infrastructure Association (WIA) Foundation announced yesterday that it will host the inaugural Mobile Infrastructure Hall of Fame Ceremony on Wednesday, November 14 at the Washington Hilton. The ceremony will honor trailblazers who have shaped the wireless infrastructure landscape and support the Foundation’s mission to create a stronger wireless workforce through training and education. Federal Communications Commission Chairman, Ajit Pai, will deliver opening remarks. From the broadcast perspective, tower crews and resources for the repack are getting tight. With winter approaching, experts predict they will have issues keeping the process of transitioning stations from their old channels to new ones moving. That’s based on Inside Towers’ interviews with broadcast engineers, engineering consultants, equipment suppliers and vendors at the IEEE Broadcast Technology Symposium Wednesday in Arlington, VA.
Unmanned Aerial Systems (UAS) can provide different work for tower climbers. 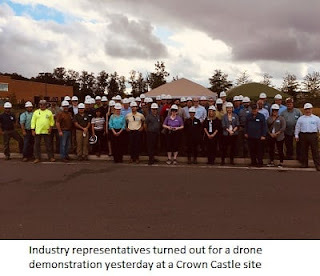 UAS inspections can save workers a climb and free them up for other tasks, said experts on-hand for a UAS demonstration Tuesday, organized by the National Tower Erectors Association. Four NATE member companies flew their UAS close to a 198-ft. Crown Castle tower in Gainesville, VA, just outside of the D.C. restricted airspace. Using UAS for tower inspections can mean one-third fewer climbs need to be performed, Jim Goldwater, NATE Director of Legislative and Regulatory Affairs, told Inside Towers. “Our job is to make sure our people get home safe,” said NATE Chairman Jim Tracy to the assembled crowd of 55-plus people. Using UAS or drones, means less risk for climbers from working at elevation, he said. Finding the best solution to re-configure the 3.7 to 4.2 GHz band was a hot topic at last week’s 7th Annual Americas Spectrum Management Conference. The FCC’s proposal specifies the use of a consortium to undertake the technical and commercial implementation of the spectrum clearing process. SES is part of the recently-announced C-Band Alliance. Other members are Intelsat, Eutelsat and Telesat. The companies say they can implement a market-based proposal to clear spectrum, while protecting the quality and reliability of existing C-band services in the band. “We will engage in secondary market transactions within 36 months” of a final FCC order, said Oberst. NPR agrees with the NAB’s assessment that a sliding scale to reimburse FMs forced off the air due to the TV repack is arbitrary and won’t work. It urged the agency to drop the plan. The public radio network also said the repack work has been disruptive, forcing at least one station off the air when a tower crew showed up unexpectedly, causing the station thousands of dollars in lost donations. Mayors of several cities vow to fight the FCC’s recent small cell order in court, arguing it’s an example of federal overreach. Inside Towers reported before last week’s vote to ease small cell siting, that several localities were unhappy with the move to curb siting costs and speed paperwork to permit wireless infrastructure on publicly-owned land. Now, several localities, like Seattle, say they plan to sue. Others, like Portland, already have filed suit, ArsTechnica reported. “We will all be busy in the next year redecorating the street furniture.” That’s how Stephan Sloan, director at Media Services Group and session moderator, summed up the infrastructure panel at the 7th Annual Americas Spectrum Management Conference yesterday. The impact of the FCC’s recent order to ease small cell siting on publicly-owned property dominated the discussion. Returning to the Competitive Carriers Association’s 2018 Annual Convention yesterday was a homecoming of sorts for FCC Commissioner Brendan Carr. He gave his first speech as a Commissioner at that event, one year ago. He said the agency began attacking a long list of pending items last year, including a swap-out order, or when a provider looks to replace a utility pole to add new antennas. He said there’s an “intense focus and coordination” on infrastructure deployment now, with leadership from the White House, in concert with federal agencies like the FCC, National Telecommunications and Information Administration and Congress. FCC’s Brendan Carr, for example, discussed the order the agency passed last week to ease small cell siting in a public right-of-way. Carr emphasized how quickly China is deploying cell sites compared to the U.S., according to the WIA executive. NAB this week urged the FCC to drop its proposal to reimburse FMs that are co-located on a television tower impacted by the TV channel repack on a graduated scale, depending on how long the disruption lasts. NAB says the concept “fundamentally misapprehends the dramatic and damaging effect of going off air for FM stations and their listeners.” Potentially “hundreds” of FMs located on or near towers supporting repacked TV stations may have to operate at reduced power or shut down entirely for “extended” periods to protect tower workers, according to NAB. As the FCC prepares to vote on an order to ease small cell siting today, Inside Towers reviews Crown Castle’s recent experiences to see why the towerco supports the Commission’s planned changes. In a recent lobbying visit, Crown Castle representatives told FCC officials, the company favors the agency’s efforts to limit localities’ application fees. Calling the proposal, “timely and necessary,” the towerco cited an example from July from Hillsborough, CA (pop. 11,420). The majority of cell sites in the Carolinas remained operating as of Monday, however the percentages of outages in some counties rose. North and South Carolina are still experiencing heavy flooding due to the storm that began as Hurricane Florence. In North Carolina, out of the 5,790 total cell sites, 683 were not operational as of yesterday. That compares to 787 cell sites not working on Sunday. The majority of cell sites in the Carolinas remained operating as of Sunday, days after Hurricane Florence made landfall. Now a tropical depression, Florence pummeled the Carolinas and parts of Georgia and Virginia with wind and rain, leaving widespread flooding. More than 700,000 people remained without power in the Carolinas as of Sunday, WWAY-TV reported. An important FAA tower lighting change became effective September 6. Several New York City television broadcasters returned to One World Trade Center earlier this year, thanks to a joint effort between The Durst Organization and the Port Authority. This marked the first time broadcasters had a presence in the World Trade Center since the events of 9/11, Inside Towers reported. Now, a PSI broadband panel antenna for the first FM at 1WTC (on 104.7 FM MHz) has been installed on the second ring of a three-ring grid on the spire at 1WTC, GeoBroadcast Solutions tells Inside Towers. Multiple stations can potentially use the antenna, via combining onto the PSI antenna. FCC Commissioner Jessica Rosenworcel says the agency should move quickly to auction unused 2.5 GHz licenses. Combining such spectrum would provide new, flexible-use mid-band airwaves for 5G services, she said at a conference in Boulder, CO, on Thursday. The FCC late yesterday released the proposed updates to its wireless infrastructure siting guidelines for states and localities to speed small cell deployment. As indicated by Commissioner Brendan Carr on Monday, the Commission changes would limit state and local governments to charging fees that are no greater than a reasonable approximation of the costs for processing applications and for managing deployments in the Rights-of-Way (ROW). The FCC plans to vote later this month to update its guidance for states and localities for wireless infrastructure siting. The agency yesterday circulated among the commissioners for a vote, a proposal that “re-affirms local control,” said Commissioner Brendan Carr in Indianapolis yesterday. He, along with several leaders from the Hoosier state, spoke from the Statehouse about the proposal. It’s not often you run into a “game changer” as Guy Bonifas of Montgomery, AL calls his new invention. As a construction manager with Crown Castle for the past six years, Bonifas has had a front row seat to the trials, tribulations and dangers involved in gin pole usage at tower sites. UPDATE Residents across the city have been waiting for the highly anticipated Google Fiber internet service since Google announced its expansion to Nashville three and a half years ago. Parts of several neighborhoods plus 52 apartment buildings and single-family homes do have access but many residents still do not, reported the Tennessean. Satellite operators and rural broadband groups are some of the voices opposing the proposed merger of T-Mobile and Sprint. Most warn that going from four to three national wireless carriers means less competition and won’t help rural 5G broadband deployment. Fourteen petitions to deny the merger were filed by the FCC’s Monday’s deadline. More than $1.4 billion was allocated to a total of 103 providers in the FCC’s Connect America Fund Phase II auction. The Commission released results of the auction yesterday. Bidding began July 24, and ended August 21. Exactly $1.488 billion will be allocated over the next 10 years to expand rural broadband in areas not served now in 45 states. The FCC says that translates to 700,000 rural homes and businesses getting high-speed internet service for the first time. The storm that began as Hurricane Lane and ended as a tropical depression had minimal impact on communications in the Hawaiian Islands, according to reports that providers gave to the FCC. More than 99 percent of the cell towers on all eight islands remained operational as of yesterday, August 26, according to the FCC’s Disaster Information Reporting System (DIRS). All five counties in the state are included: Hawaii, Honolulu, Kalawao, Kauai and Maui. Lane was downgraded to a tropical storm on Saturday and to a tropical depression on Sunday. DIRS for Lane was discontinued as of yesterday.